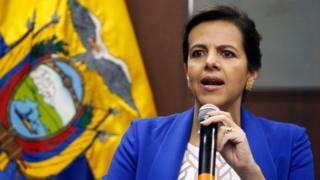 Interior Minister María Paula Romo did not name the man but said he had been arrested for "investigative purposes". "A person close to Wikileaks, who has been residing in Ecuador, was arrested this afternoon when he was preparing to travel to Japan," Ecuador's interior ministry tweeted late on Thursday. The man has lived in Ecuador for several years and has frequently travelled to the country's London embassy where Assange had been staying, Ms Romo told CNN's Spanish language service. "He has been detained simply for investigation purposes," she said. "I'm very concerned to hear that [he] has been arrested," Martin Fowler, a US-based computer programmer, tweeted. "He is a strong advocate and developer supporting privacy and has not been able to speak to any lawyers." In response, Mr Bini said on Twitter that her comments showed a "witch hunt" was under way. 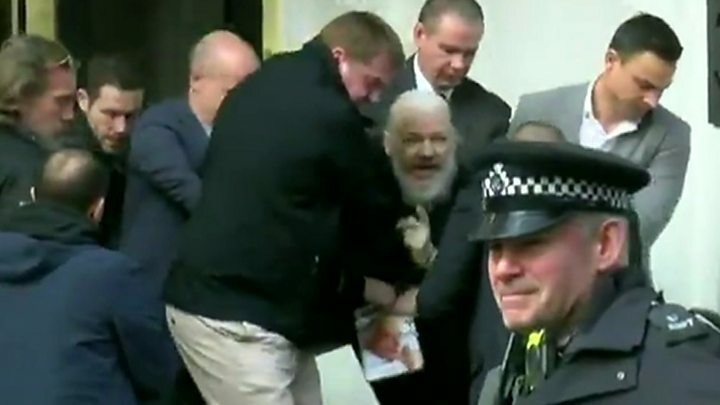 Ecuador withdrew Assange's asylum on Thursday and the Metropolitan Police say they were then invited into the embassy to arrest him. Ecuadorean President Lenin Moreno said the country had "reached its limit on the behaviour of Mr Assange". The UK will decide whether to extradite him to the US. His lawyer said they would fight the extradition request because it set a "dangerous precedent for journalists, whistleblowers, and other journalistic sources that the US may wish to pursue in the future."